There are No Haters allowed at the Fall Boogie in Waverly, Alabama. It’s on the flyer next to No Dogs and No Glass. It’s on a pretty poster for sale at the Standard Deluxe design and print shop store where you spend way too long deciding which t-shirt you want to buy (the one with the possums or the one with the armadillo?). It’s on the neighbor’s mailbox. It’s in the atmosphere. 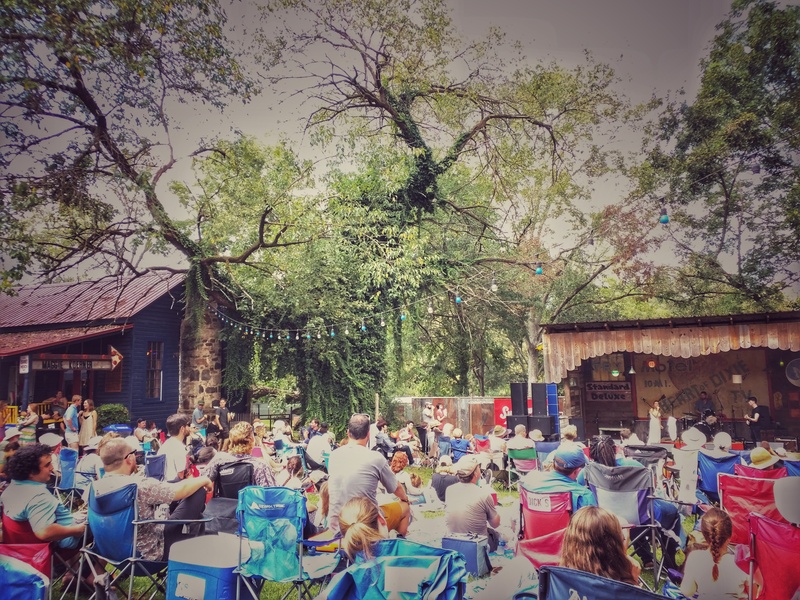 This weekend a couple hundred new friends and I brought picnics and lawn chairs and set up for an all day event, six bands from 11 a.m. to 9 p.m., basically in a big backyard. This year was the 6th annual Fall Boogie held at the Standard Deluxe, which is a concert venue throughout the year. Earlier this year in April was the 17th annual Waverly “Old 280” Boogie. 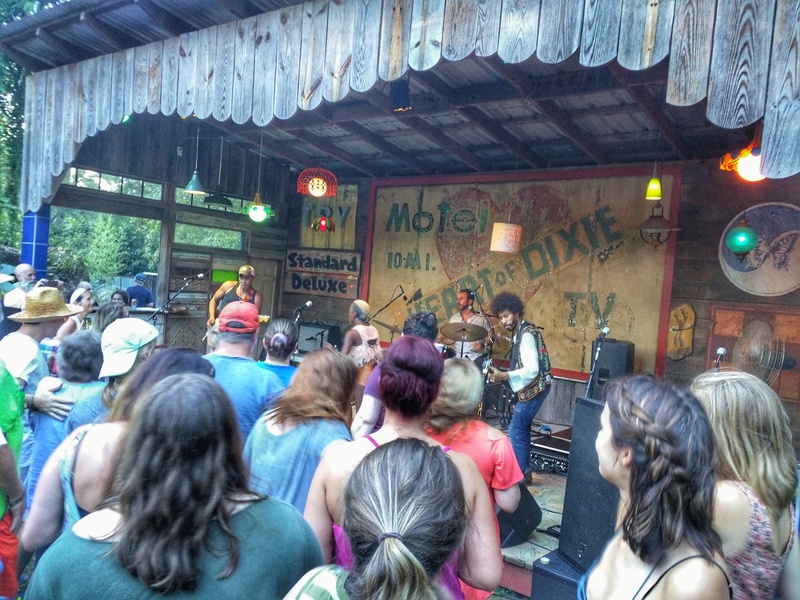 Both festivals are high quality music experiences held in the lawn between a picturesque cluster of rustic buildings across from a tiny old graveyard in small town Alabama. Someone’s child a few blankets over is blowing bubbles and they drift by in front of me. It might be three-year-old Louise who introduced herself earlier. Faye Webster is softly singing lush folk songs from a porch stage under yellow and green globe lights and colored lanterns. 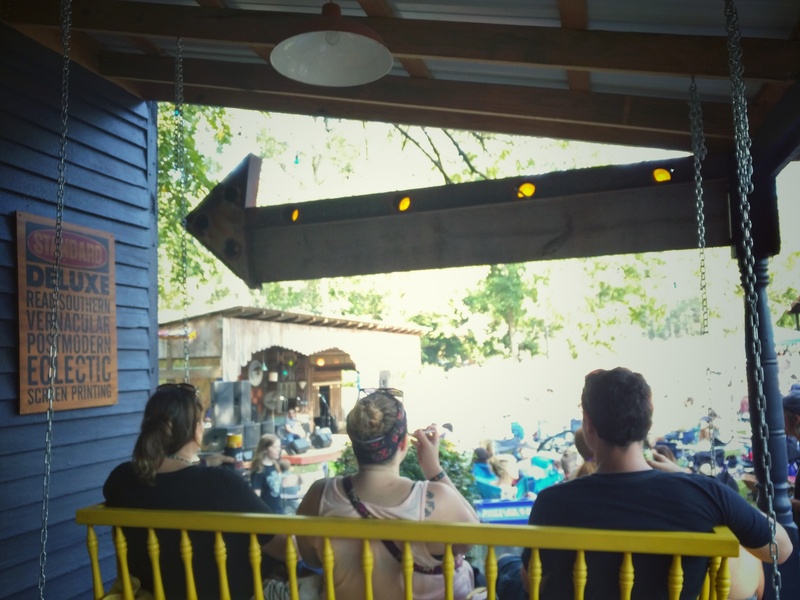 A few people are listening from a yellow porch swing off to one side. I’m in the grass, sipping a basil and lime cocktail brought from home. Someone beside me is sketching while she listens to Faye. The weather is nice. The sun is shining but we are under a canopy of pine and pecan trees protected from the Alabama heat. Later in the day there is a brief rain shower. We giggling, scramble to hide our picnic foods back in coolers and gather under umbrellas if we thought to bring them. No one packs up to leave. People seem comfortable with the unexpected, with going with the flow. Everyone keeps enjoying Maggie Koerner’s smouldering vocals that couldn’t be suppressed by wetness and the temperature change that comes with the rain. To the back of the lawn is a collection of food vendors and artists; there is woodwork, pottery, candles, jewelry, wall prints and geodes. It’s a great place to buy a handcrafted gift for a friend or a delicious dinner. There is a man surrounded by children making wire sculptures who says that he’s making a “willitgoround.” Photographers are doing tintype photos there at the venue. It is pleasant visiting with the artists, hearing their stories and seeing what they create. There are so many ways to experience the music here. When I went a few years ago to the “Old 280” Boogie, I got there early and got a spot on the lawn near to the stage and from my lawn chair I payed close attention to the lyrics and stories the bands would tell. This year some of the time I find myself being drawn to the front where people are dancing. The bands vary, so the style of dancing varies as well. Audience members are swing dancing to one of Heath Green and the Makeshifters’ songs. During Revel in Dimes’ set, a guitarist comes out into the excited audience during an encore. Sadly, we miss Lonnie Holley Band, but I’m sure they were amazing as every band I’ve heard at Waverly is impressive. Sometimes I find it is just as enjoyable to let the music wash over me as a background as I adventure and explore, wandering down side roads, peeking over fences at gardens, admiring houses with tin roof and balconies, dancing in dirt roads, waving as I cross paths with others who have gone out for a stroll. It is the kind of day when you stumble on wild muscadines, when you fill your pockets with fruit from the side of the road and eat them unwashed while you walk side by side with friends listening to live music that you can hear from the distance. When night falls, green and white lights that had been strung over our heads make the scene even more magical. A man is dancing to Lee Bains III and The Glory Fires in the back of the crowd, swinging glowing balls that change color on strings in graceful arcs. A crowd of children has gathered and stare enrapt. A few yards away someone has lit a large bonfire and when you stand in the right place you can watch it burn. The moon is an orange crescent. It lights the way during our hour drive down dark country back roads most of the way home to Montgomery while the many hours of great music echo in my mind.